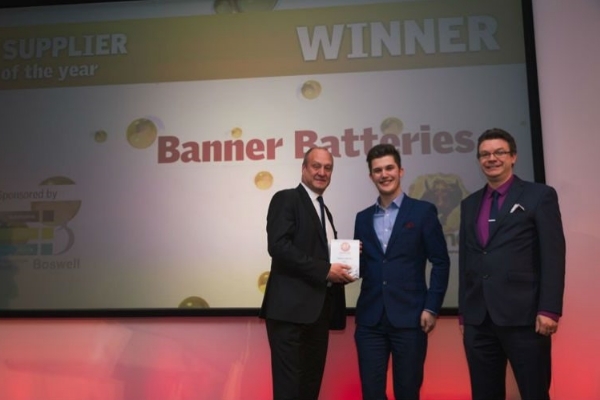 Banner Batteries is on the charge once again having been voted ‘Supplier of the Year’ at the prestigious and acclaimed 2019 CAT Awards. Now in their 40th year, Banner lifted the flagship CAT award having fought of competition from a number of aftermarket heavyweights, including Mahle Filters and Denso. This latest award accolade is the third ‘Supplier of the Year’ title that Banner has attained in the four years since Country Manager, Lee Quinney, took over stewardship of Banner Batteries’ UK aftermarket operation. In addition to having successfully kick started 2016 on the back of having secured the IAAF (Independent Automotive Aftermarket Federation) ‘CV Supplier of Excellence Award’, Banner went one better the flowing year when they fended off the interests of some 19 nominations within the Car Supplier category to lift the esteemed ‘Car Supplier of Excellence’ Award. With this year’s CAT awards being held at Manchester’s premier five star hotel, The Lowry, Banner’s Quinney received the award from editor, Greg Whittaker and award sponsors, Matthew Bunn of Boswell Aftermarket. As an ecstatic Lee Quinney said: “To build on the awards success that we have enjoyed over the lat few years is beyond our wildest expectations. And to be chosen as the CAT ‘Supplier of the Year’ against some tough opposition from some of the aftermarket’s leading exponents makes this award all the more sweeter. It goes without saying that such an achievement would never have been possible had it not been as a result of combined efforts of the whole team at Banner. They continue to work tirelessly to drive forward the company’s ambitious development strategy and the award serves to recognise the hard work, endeavour and enthusiasm that they have shown. “I would also like to thank everyone at CAT for putting on yet another first class awards ceremony, not to mention all of those who took time to vote Banner Batteries. The CAT Awards are arguably one of the most prestigious within the automotive aftermarket and we are understandably delighted to have come out on top this year,” he added.